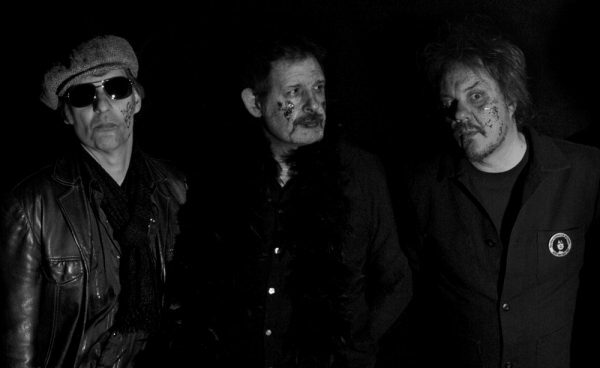 Ace Birmingham grease-rockers BLACK BOMBERS have covered T REX for Record Store Day. And they’re premiering the video exclusively with Vive Le Rock! The original version of ‘Raw Ramp’ appeared on the B-side of T Rex’s ‘Get It On’ single in July ’71. The Bombers’ version, released by Easy Action on a 500-copy limited edition double A-side 7″, comes coupled with an exclusive new band original ‘Rush’. Both sides feature vocal contributions from Rachel Mayfield, and were produced by the band and Paul Gray. Releasing their debut album last spring to great acclaim, Black Bombers boast a CV that includes stints with such legendary Birmingham bands as THE PREFECTS and GUNFIRE DANCE, a well as JOHNNNY THUNDERS & THE HEARTBREAKERS guitarist Walter Lure and the current line-up of THE GODFATHERS. Pre-punk children of the glam revolution, Bombers guitarist/vocalist Alan Byron was initiated into the electric boogie by his two older brothers, while drummer Dave Twist fondly recalls catching the Bolan / Damned package at Birmingham Odeon on the final T Rex tour in 1977. Their cover and its accompanying video – featuring the band as a glitter-streaked undead in a collage by fine artist and videographer Poppy Twist – provide a dark, very Black Bombers, take on this year’s 40th Anniversary of Bolan’s death. ‹ SPITFIRES ANNOUNCE NEW SINGLE! Top version lads. As Dirty as Marc intended. Super cool Version. Marc and Kevin would love it.